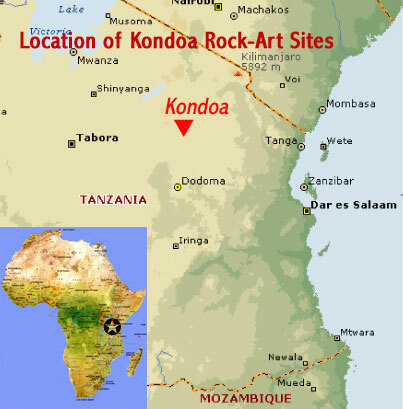 This course was organized by Rock Art Conservation Center of Tanzania (www.warmheartart.com) in Arusha – in order to locate, preserve, protect, interpret, and promote Tanzania’s little-known ancient rock paintings some as old as 20,000 years – situated in a remote area of the country. On the walls and ceilings of isolated rock overhangs and shallow caves are thousands of drawings and paintings of abnormally elongated human figures with foreshortened arms and legs and oversized heads, some of which appear to be floating or flying. These part-human, part-animal beings, semi-realistic animals, birds, and reptiles, as well as numerous geometric motifs were first documented by Mary Leakey in 1951. In addition to graffiti – deforestation for local wood fuel production is of great concern and woodlands associated with rock art sites serve as natural barriers against the weathering of painted rock surfaces by driving wind-blown sands and rain. The Art and Environment Course in 2011 (funded by the Finnish Foreign Ministry) was designed for 10 youngsters and 2 assistant teachers from Mnenia Secondary School and who were taught to appreciate and look at their environment with new eyes. Activities included a variety of observation and drawing exercises related to both the local flora, the Rock Art Site figures, as well as creative recycling of card and simple printing techniques on hand-made paper – that could enhance local income.